The new Toyota Camry is again this year seen as a midsize sedan grabbing a lot of attention. 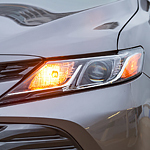 These are a few safety features drivers appreciate in the new Camry. The Dynamic Radar Cruise Control feature is unlike your average cruise control. Once you get the Camry on the highway and set the desired speed, the system will scan ahead to ensure there is a safe distance between you and the car ahead of you. If a car is too slow ahead, the system will use the brakes to slow slightly to avoid a collision, then return to desired speed when clear. The other safety feature, the Automatic High Beams, activates at night and improves visibility until a car is coming in the opposite direction. The low beams are then activated and high beams toggled back when clear. Take the Camry for a test drive when you visit Marion Toyota today!